The possibilities are endless with Rite Envelope & Graphics, Inc.’s extensive inventory of envelopes for business and personal needs alike. Customers can choose from various envelope sizes, styles, and colors and order bulk quantities at wholesale prices. Isn’t it time your Philadelphia, Baltimore, or Washington based company separates itself from the competition with unique, customized business envelopes? Rite Envelope & Graphics has over three decades of experience, bringing our commercial clients print ideas to life with wholesale pricing you won’t find anywhere else. Do You Need Personalized Wholesale Envelopes? 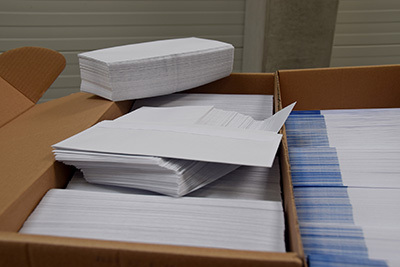 At Rite Envelope & Graphics, Inc., we create custom printed business envelopes and personalized envelopes for special occasions on a wholesale scale. Stationery envelopes: are typically windowless and are designed to complement or match a particular stationery. We have colored paper options for both full and spot coloring, as well as a variety of paper types and weights. Business envelopes: are used to display a window of information while enclosing an important document. Our wholesale envelopes for business come complete with a transparent poly window, adhesive back closure, and a bevy of options on text and image details. Mailing envelopes: are larger on average to accommodate booklets and catalogs that can be distributed to customers and clients through the mail. All of our wholesale envelopes are constructed from the highest quality materials to ensure the safety of their future contents. Announcement envelopes: are quite broad in design as they are used for a multitude of different purposes. They can house greeting cards, notecards, invitations, and other types of notification documents. Commercial advertisements and reports can be supplied with a standard gummed envelope or folding envelope and clasp. For traditional style announcements, we have options for cotton fiber, sulphite, and other kinds of paper. For a more contemporary feel, we have parchment, laid, and other texture finishes as well. We can customize any of our products because we are leaders in the commercial print industry; this includes style, shape, size, color, material, and more. We run our prepress department entirely digitally, direct to plate so that we eliminate any use of silver and film chemistry, keeping resource waste and chemical waste to an absolute minimum. We recycle all of our paper, printing plates, and boxes. We only use vegetable and soy-based inks (reducing our carbon footprint and keeping our products safe to handle). …And all areas throughout the United States. Any interested parties can call us at 610-981-2373 to inquire about our products and services. We will be happy to answer your questions on shipping, pricing, wholesale orders, and more either by phone or online.